VATICAN CITY (CNS) — Welcoming in a new year, Pope Francis said it was time to stop provoking and ignoring violence, tragedy and conflict in the world, and begin building peace at home. “Justice and peace at home, among us — you begin at home and then you move on to all of humanity. But we have to start at home,” he said Jan. 1, which the church marks as the feast of Mary, Mother of God and as World Peace Day. People must not remain “indifferent and immobile” in the face of violence and injustice, but commit themselves to “build a truly more just and caring society,” he said. The pope referred to a letter he had received the day before from a man struggling to understand why there were still so many tragedies and wars. The pope said he wanted to ask the same question: “What is happening in people’s hearts? What is going on in the heart of humanity” that leads to violence? May God “help all of us walk the path of justice and peace with greater determination,” he said, and the Holy Spirit break down the obstinacy and barriers people construct between each other. Earlier in the day, the pope celebrated Mass in St. Peter’s Basilica, which was decorated with white flowers, evergreens, gold trim and poinsettias. 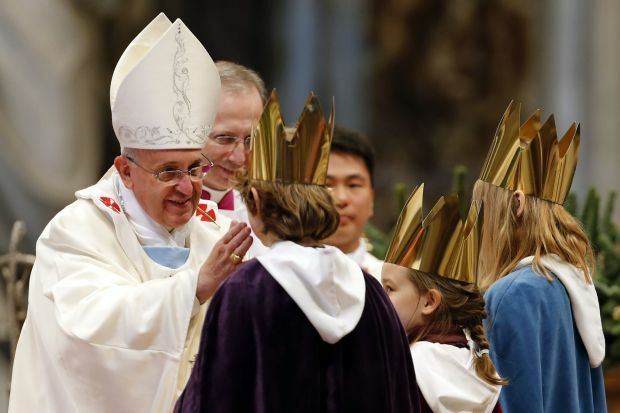 Two girls and one boy, wearing long capes and shiny gold paper crowns in memory of the magi who traveled to Bethlehem, brought the offertory gifts to the pope. In his homily, the pope said Mary, the Mother of God, became the mother of all humanity when Jesus, dying on the cross, gave her to the world. When she lost her divine son, “her sorrowing heart was enlarged to make room for all men and women, whether good or bad, and she loves them as she loved Jesus,” he said. In his homily, Pope Francis also mentioned the Marian icon “Salus Populi Romani” (health of the Roman people) in Rome’s Basilica of St. Mary Major, which he said was the first Marian shrine in the West where the image of the Mother of God — the “Theotokos” — was venerated. According to Vatican Radio, the pope visited St. Mary Major Dec. 31 to pray at length before the icon, repeating a pilgrimage he made on the first morning of his pontificate in March and on other subsequent occasions.